I played today a course where I've played probably 50 times previously, and as recently as 10 days ago. The 18th hole is a 180-yard par-3, a very simple hole. As I stood on the tee, however, something jumped out at me: a small but steep-sloped bunker, right smack in front of the right side of the green, was staring me right in the face. When did they put that thing in? I was absolutely positive this bunker did not exist when I played this hole just a week and a half ago. And boy, what a difference it makes in how the hole sets up, how it looks from the tee. When I finished playing, I stopped in the clubhouse to ask about the bunker. "When did you put that in?" I asked. "It's always been there," the pro told me. Whaaaa? It's always been there? Wow. I would've sworn that bunker was brand spankin' new. Obviously, in the 50 or so times I'd played this course, I'd never hit into it. It had never even been a concern. It couldn't have been, or I wouldn't have been so shocked when I noticed it today. Today, when I finally did notice it, I hit a weak fade right smack in the middle of it. The moral of the story? The more you focus on trouble, the more trouble you're going to find. Who the heck is "Count Yogi," and what does he have to do with golf? Count Yogi was an enigmatic - some would say mysterious - golfer born in the early part of the 20th century who barnstormed the country playing exhibitions, conducting trick-shot shows, and occasionally playing real tournament golf (although not on the PGA Tour). He was also, some claim, "the best golfer you've never heard of." A golfer who had "the secret" to playing better golf. You might say he was the Moe Norman of an earlier time. As you can see from the photo, Count Yogi - whose real name was Harry Hilary Xavier Frankenberg - was an odd duck. 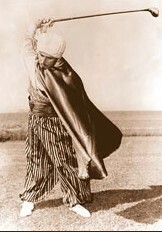 He sometimes played in a cape and turban, as in the photo. There's a golf instructor today who sells the Count Yogi way of playing golf. "Golf's greatest secret finally revealed," his Web site says. It also says Count Yogi is "the most imitated man in golf history." I'm not sure how someone can be the most-imitated in history while also being at the middle of a great secret, but whatever. Also has shot scores of 55, 57, 58 and 59 in 18-hole rounds. Shot a 59 in winning the best ball title at Greenview Country Club, Chicago. Shot seven birdies in a row for a world tournament record (held for eighteen years) in the 1941 Chicago Open at Elmhurst Country Club. Averaged 67 per round for 203 rounds of 18-hole golf in 1940, playing either right handed or left handed. Played a 550-yard hole in two strokes in Corpus Christi, Texas, driving 453 yards and sinking the next shot with a wedge. Drives of 453, 450, 435 and 425 yards. Fourteen putts for eighteen holes (score 29-29=58) on par-72 Wilson Golf Course, Griffith Park, Los Angeles, former scene of Los Angeles Open, 1951. 645-yard par-6 hole in 3; 59 on par-74 course, 1933. Eight birdies and two eagles in succession in a 58 at Paw Paw Lakes Links, Michigan, 1939. Played eighteen holes in fifty-seven minutes and 69 shots; fastest round (not cycling, but walking), mid-City Golf Course, Chicago, 1948. 31-32=63 course record at Bel Air Country Club, Los Angeles, 1948. 34-31=65 par-73 to win Metro Goldwyn Mayer's annual Open, 1949. 31-36=67 at Western Avenue Golf Course (Los Angeles) to win Universal International event, while in Hindu suit, 1949. My initial reaction to these claims is skepticism. Recordkeeping for Tour players was terrible during that time period, so it's a good bet the recordkeeping was even worse in local events. But many of those alleged feats are ones for which there should be a paper trail: contemporaneous newspaper accounts, club histories, and so on. But if he was that good, why wasn't Count Yogi winning PGA Tour tournaments? It should be noted that Count Yogi was half-American Indian, and the PGA of America, shamefully, had a caucasians-only clause in its bylaws during this time in its history. Perhaps this clause was applied to Count Yogi. Perhaps - some Count Yogi aficionados claim - the PGA of America was scared of Yogi because, after all, he had the secret. And if he was allowed to play in Tour events - some of which he would, of course, win - he'd become famous. And then golfers would stop paying for lessons with PGA Professionals and start using the Count Yogi method to play better golf. And so the PGA of America blackballed Yogi, this argument goes. Or maybe Count Yogi was just a strange man with a penchant for acting like a jerk. An article that originally appeared in the in-flight magazine of Southwest Airlines recounts the story of a 1942 PGA tournament in which Yogi "led qualifying." When he found out his tee time for the main draw was 7 a.m., however, he stormed out, believing it was a slight by the PGA. He was Count Yogi, after all, and deserved a featured pairing. I'm not sure what to make of the Count Yogi story. There seems to be very little information about him available, and much of what is available seems to be stories and anecdotes passed down from friend to friend, rather than original source material. There was a 2005 Golf Digest article by noted golf writer George Peper, adapted from his book, The Secret of Golf, in which Peper listed 18 innovators in golf instruction, teachers who at one time or another were touting (or were touted for having) "the secret" to golf. "He is the mysterious Count Yogi. Banned from golf by the PGA of America - as much for his strident views as his non-Caucasian heritage - he did barnstorming exhibitions and taught the game, exhorting his pupils to set up with their hands well back and left elbow bent, to pick every shot cleanly, and above all to play the game with grace and elegance." Huh. Ty Webb might appreciate that, but color me unimpressed. Here's the real secret to golf instruction: there is no secret! It's pretty easy to grasp this concept with a little simple logic: If any of the alleged secrets in the history of golf swing instruction did what their proponents imply they do (and they all, to one degree or another, imply revolutionary results guaranteed to work for everyone), then they wouldn't be secrets! Everyone, including rival instructors and Tiger Woods, would be all over it. Which isn't to say that any given "secret" doesn't have value; many of them surely do. They're just not really "secrets," and not revolutionary (or easy).